She & Him are playing the what and where? Mysteries abound! 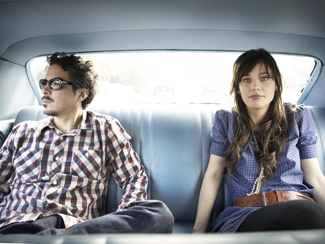 Sam JonesShe & Him are not a band given to mystery. Despite the anonymous name, everyone knows it’s Matt Ward and Zooey Deschanel and their sugar-sweet old-timey country-pop sound is pretty well-established at this point. And if you’re at all surprised that their third album, announced yesterday as coming May 7, is called Volume 3, then you really haven’t been paying attention. But residents of the Greater Toronto Area looking at the tour dates that accompanied the announcement can be forgiven for scratching their heads about the local date on the itinerary. Toronto Urban Roots Festival what? With a lineup comprised so far of She & Him and Scottish pop darlings Camera Obscura – and presumably there’ll be more, else it’s not much of a festival – we also know it’s happening July 4 at a venue that Pollstar not-so-helpfully lists as “Toronto Urban Roots Festival Grounds”. Possibilities include an Olympic Island concert – it’s been a few years since we’ve had one of those though the Thursday date makes it unlikely to be the full-day event that would probably be necessary to justify the logistics – or maybe an evening-into-night to-do at the new go-to outdoor venue of Garrison Commons at Fort York? Surely it’s something besides an indoor venue show, else why the fancy name? The trail of online bread crumbs also tells us who’s running it, but they’re not talking right now. Next week, perhaps. Until then, we’ve got us a little mystery to chew on. Far less ambiguous is the return of “The Screaming Eagle of Soul” – Mr. Charles Bradley – in support of his second album Victim Of Love, out April 2. BrooklynVegan has all the tour dates but all Toronto needs to know is that he and his Extraordinaires will be at The Phoenix on May 11, tickets will be $22.50 in advance, his last visit was incredible, and a song from the new record is available to stream below. See how easy it is, Zooey? Austin country-rockers Phosphorescent will release their new one Muchacho – stream a song from it below – on March 19, and the subsequent tour dates bring them to The Horseshoe on April 15. Tickets for that are $15 in advance. With the release of We The Common less than a week out, Thao & The Get Down Stay Down are streaming the new record over at NPR; there’s also an interview with Thao at Exclaim. They’ll be at Lee’s Palace on March 27. The 405 and Express Milwaukee talk to Ira Kaplan of Yo La Tengo, and if you’re more of a James McNew fan you’ll be pleased to know his first two records as Dump are getting reissued on vinyl for the first time ever. Superpowerless is out March 19 and I Can Hear Music on April 16; stream a track from each below. Mount Moriah are streaming a song from their new album Miracle Temple, out February 26. They play a Canadian Musicfest showcase at The Drake on March 20. Whole lotta Bob Mould on your TV (or the computer you use as your TV). His performance from last weekend’s episode of Austin City Limits is now available to stream, and a new video from Silver Age – premiered via Late Night With Jimmy Fallon – was just released. See Bob in person at The Horseshoe on March 1. Brooklyn’s The Men have gone the live performance route for the first video from their forthcoming New Moon, out March 5. Interview has an interview with Ra Ra Riot, who have made the title track of their new album Beta Love available to download. They play Lee’s Palace on March 6 and are part of the Arts & Crafts Field Trip fest at Fort York on June 8. Black Rebel Motorcycle Club are streaming the first track from their forthcoming Specter At The Feast. It’s a sentimental choice, being a cover of The Call’s biggest hit; Call frontman Michael Been – father of BRMC frontman Robert Levon Been – passed away in 2010. The album is out March 18 and they play The Kool Haus on May 9. With their new album Hummingbird out this week – and a new MP3 from it available to download – Local Natives are the subject of features at The Line Of Best Fit, The Daily Beast, BBC, Consequence Of Sound, and The 405. They play a sold-out show at The Opera House on March 28. The Flaming Lips have confirmed an April 2 release for their new album The Terror and have put out a lyric video for the first single. Details on the release over at The AV Club. The Strokes have released a new single which pretty much guarantees that a new album isn’t far off, but they’re not offering any other details for now. You can download it from their website in exchange for an email address and a promise not to make any a-ha jokes. Update: It’s called Comedown Machine and out March 26. Spin and Washington City Paper have conversations with Widowspeak, who’ve released a new video from their excellent new record Almanac. It’s really excellent. Also with a new video are Grizzly Bear, taken from last year’s Shields. They’ve also offered some director’s notes on the clip via their Tumblr. NPR welcomes Dinosaur Jr for a World Cafe session. Billboard finds out what Jenny Lewis has been up to – finishing up a new solo record, putting in time on that Rilo Kiley rarities comp, and maybe taking part in the Postal Service tour? LA Record chat with Redd Kross. Wears The Trousers and The Telegraph have interviews with Aimee Mann. NPR are streaming a World Cafe session with Father John Misty. TwitterYo La Tengo haven’t quite spilled the beans on their thirteenth studio album, besides to acknowledge it exists, that recent single “Stupid Things” will appear on it albeit in a different version, that it was produced by Tortoise’s John McEntire, that it’ll be out in late January – the smart money is on the 29th, since the last week of the month is typically when the year’s first big releases are slated – and that a North American tour – of which only a few dates have been revealed – would follow. And while a tweet yesterday implied that today was the day for revelations, details on the Toronto show came yesterday – and so here they are: Hoboken’s finest will be at The Phoenix on February 9 – their first visit since October 2009, not counting their “Sounds Of Science” performance here in April. Tickets for that are $25 in advance and go on sale Friday. While on the topic, I just finished reading Big Day Coning: Yo La Tengo and The Rise of Indie Rock. You might wonder how interesting a bio of a band that has been rather resolutely drama-free over its career could be, but it’s the understatedness of their story – plus the greatness of their music – and how it intertwines with the transformation of the underground to college to alternative to indie rock scene that makes it an interesting read. I had hoped to get up this morning and find all the salient new album info conveniently collected in a press release in my inbox, but instead there was an email from the library telling me that the aforementioned book was a week overdue. Not quite the same thing. 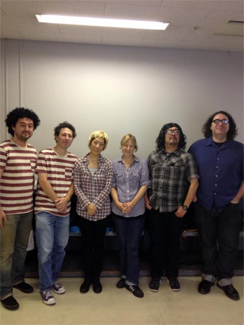 So I’ll update this post with specifics about the tour and release when they surface today – assuming they do – but in the meantime, marvel at the photo up above, picked up via Matablog, of Yo La Tengo with a trio of Japanese lookalikes. Don’t ask why or how, just marvel. Update: And Matablog has it: Fade, out January 15, and tour starts the 23rd. 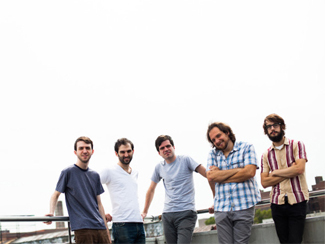 Keeping with the New Jersey theme, Titus Andronicus are interviewed by Beatroute, Boise Weekly, and Pitchfork and a couple more tracks from their latest Local Business are available to download. They’re at Lee’s Palace on November 27. And if you were wondering what former Titus guitarist Amy Klein was up to, know that in addition to playing in Leda, she’s got a drum-and-guitar duo called Hilly Eye. Exclaim has some details on their debut album Reasons To Live, due January 22, and a couple of songs are available to stream. The Village Voice, Red Eye, and Seven Days have interviews with Sharon Van Etten. Interview talks to Paul Banks about balancing the solo work with Interpol. Nada Surf have released a video from their latest, The Stars Are Indifferent To Astronomy. Some feel it’s still to early for Christmas music, but Sufjan Stevens is hoping that doesn’t apply to him. He’s made the whole of his six-EP Silver & Gold box set – that’s 58 tracks worth – available to stream and also released a couple more videos for good measure. It’s available to buy as of yesterday. Pitchfork has details on the second album from Brooklyn’s Widowspeak; Almanac will be out on January 22 and the first MP3 from it is available to download. School Of Seven Bells are streaming the whole of their new EP Put Your Sad Down, released this week. Filter talks to Grizzly Bear. Ra Ra Riot are streaming the first track from their new record Beta Love, out January 22. They bring it to Lee’s Palace on March 6. There’s also a feature on the band at syracuse.com. Head over to RecordStoreDay.com to stream the whole of Chocomel Daze, the You’re Living All Over Me-vintage Dinosaur Jr live record being released on vinyl-only next week. SF Weekly talks to Greg Dulli of The Afghan Whigs. Jim James is done hiding behind bands and pseudonyms; he’ll release his solo debut Regions of Light and Sound of God on February 5 – details at Pitchfork and the first taste is streamable below. The Chicago Tribune, Boston Globe, and Newsday talk to Aimee Mann, who has released a new video from her latest Charmer. WikipediaSkyfall, the twenty-third film in the James Bond franchise, is now here and with it comes another Bond theme, this one courtesy of Adele. “Skyfall” is a solid tune in the Bond tradition and charted respectably – number two in the UK – but only time will tell if it becomes as famous a contribution to the Bond canon as, say, Carly Simon’s theme for 1977’s The Spy Who Loved Me, though “Nobody Does It Better” is arguably one of the least Bond-like themes of them all, more romantic ballad than spy-game thriller. 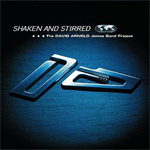 Still, it wasn’t going to be left out when British composer David Arnold assembled his Shaken and Stirred tribute compilation to Bond themes in 1997, which included Aimee Mann doing a slick version of Simon’s song. And while intended as a labour of love, it turned out to be a pretty good job application as well – with legendary Bond composer John Barry’s endorsement, Arnold would be hired as composer for five 007 films from Tomorrow Never Dies through Quantum Of Solace. Aimee Mann is at The Danforth Music Hall on Tuesday night, November 6, in support of her latest, Charmer. Skyfall premiered in the UK on October 23 and has been rolling out worldwide since then; the North American release is this Friday, November 9.